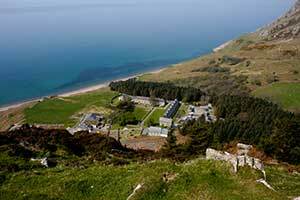 The Welsh language and heritage centre, Nant Gwrtheyrn, is located in an old granite-quarrying village on the Llyn peninsula. The entire village was bought in the late 1970s with the intention of transforming it into a language centre. All participants in the retreat will be housed in the former quarrymen cottages which have undergone modern refurbishment presenting all attendees with four star en-suite accommodation or the group accommodation block which is similar to a residential type setting. Due to great demand for the limited places on the retreat, as well as our endeavour to keep the course fee to a minimum, students will be obliged to share a suite with up to two other course participants. There a small number of rooms in the group accommodation block where students may be required to share a room with five other students. A maximum of three self-contained en-suite rooms will be allocated towards the housing of four families who desire to live together throughout the duration of the course. Priority will be given to larger families with young children who are unable to live in the 'singles' accommodation due to the size of their family.